Our dedicated, seasoned employees are passionate about what they produce. 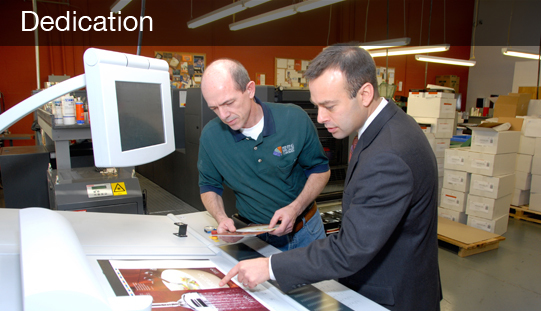 From the simplest postcard to the most complex, multi-color, die cut piece, each of our people who handle your job is committed to making sure it is done correctly and on time. Our customer service and graphics people are experienced professionals, who know your software and file formats and have a wealth of knowledge. Deadlines that might seem impossible to most printers, are considered "normal" here... ...our schedule can be changed at any moment, to accommodate that emergency order. Almost all of our production is done here in our own plant, by local people, not by someone in another city or state. We are a socially responsible company and offer complete healthcare, vision, disability and dental to all employees, along with flex hours, profit sharing, life insurance and 401k matching programs. We have the most current, technologically advanced equipment and software available. We are centrally located between Baltimore and Annapolis, and easily reached via I-97, near BWI Airport. We have been satisfying our many clients and growing steadily since we began in 1970. "We have the people, the experience and the tools to meet even the most critical deadlines"